Vintage U.S. cars pass by a fleet of Chinese-made Yutong buses parked at the sea front Malecon in Havana, Feb. 10, 2017. China's growing presence gives its companies a head start over U.S. competitors in Cuba's opening market. It could leave the island less exposed to the chance U.S. President Donald Trump will clamp down on travel to Cuba and tighten trade restrictions loosened by his predecessor, Barack Obama. Aridania Rubens works beside a Chinese-made Haier refrigerator at her restaurant in Havana, Feb. 10, 2017. “If and when the Trump administration increases pressure on China ... China may decide to double down on its expanding footprint in the United States' neighborhood,” said Ted Piccone, a Latin America analyst at the Brookings Institution think tank. China, the world's second-largest economy, sells goods to Cuba on soft credit terms. It is Cuba's largest creditor and debt is regularly restructured, though amounts and terms are considered state secrets. 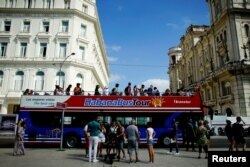 Tourists disembark from a Chinese-made double-decker Yutong bus in Havana,Feb. 10, 2017. “We are happy to see that recently countries around the world are all expanding cooperation with Cuba. I think this shows that all countries have consistent expectations about Cuba's vast potential for development,” Chinese Foreign Ministry spokesman Geng Shuang told reporters. A report on the government's official Cubadebate media website last month said the two countries agreed to strengthen cooperation in renewable energy and industry, with 18 Chinese firms taking part in a three-day meeting in Havana. 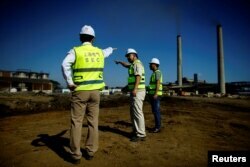 Chinese employees of Shanghai Electric company supervise the construction site of a biomass power station in Ciro Redondo, Cuba, Feb. 9, 2017.